Granite and Marble Fabrication Process The sequence of events which brings natural stone from the quarry to the home has not changed much since stone entered the homes of the ancient Greeks. This beauty is not without cost and maintenance. Fabrication price is a function of where in the world the granite is mined, how deep it is mined, and whether or not it is under water. Granite does need to be sealed from time to time; intervals usually measure in years, not months. It is a simple process and we carry a do-it-yourself kit to keep your granite looking and performing great for years. It all starts in the mountains, where the material is blasted from the quarry and cut into large blocks. The granite blocks are then cut into thin slices, usually 2cm =3/4″, 3cm =1 1/4″, then polished and loaded into containers. The slabs are ready to be shipped all over the world from places such as Brazil, India, Ukraine, and Italy. 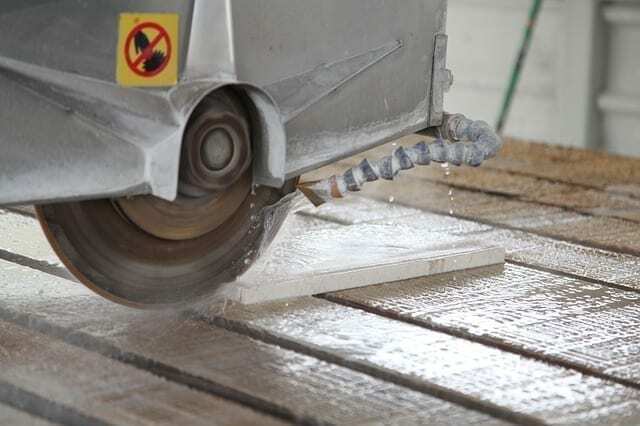 Once delivered to our warehouse, the newly polished slab is worked by both machine and by hand. At Countertops Design, we employ some of the most skilled staff in the industry who operate highly advanced equipment to ensure you receive the best possible countertop. Our design staff will guide you through the selection process and help you decide which granite is right for you. Step 1: When you come with your Countertop or Cabinet layout, your slab of stone (granite, quartz, marble,..) is hand selected by you! Step 2: After your kitchen template is finalized, we use the dimensions of your countertops to rough cut the granite slabs into more manageable pieces. 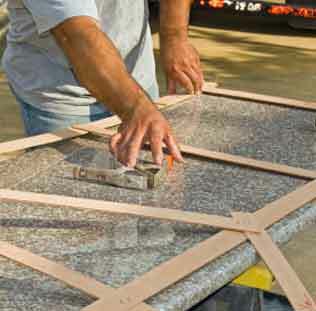 Step 3: Using our state-of-the-art stone cutting machine, we cut the granite to the exact dimensions of your countertops. Step 4: Sinks and complex edges are hand polished by skilled professionals using diamond pads and water to achieve the highest-quality finish. We’re almost ready to start your kitchen countertop project! Step 5: Your finished countertop is delivered on a steel A-frame, ready to be installed and enjoyed!